Salagrama salivary duct and salivary glands (scheme). 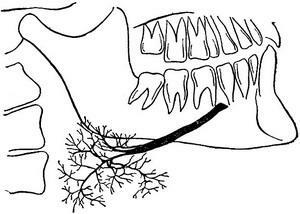 Sialography is the method of roentgenologic examination of the salivary ducts by filling their contrasting substance with the subsequent x-rays. Sialography apply for recognition of concrements (stones) and other diseases (inflammations, tumours, and so on). The study is preceded by a review radiography salivary glands and the duct. Then retrograde, i.e. from the side of the outlet salivary duct, using dvuhkrugovogo syringe enter 0,5 -1,0 ml of contrast agents (see) - yodolipola, lipiodol, iodeene - and re-produce x-rays - sialogram (Fig).